As your big move approaches, choosing the right size of the shipping container can seem like a minefield. You’ll probably see lots of 20-foot and 40-foot containers around, but many people don’t need so much space. That’s when the non-standard, smaller containers can really come into their own. Packing up a small one-person flat? Looking for a container that can be easily transported overland? These small but perfectly formed containers could be ideal for you. When are 10-foot shipping containers used? First up, if you want to ship your belongings by sea, 10-foot shipping containers may not be the option for you. 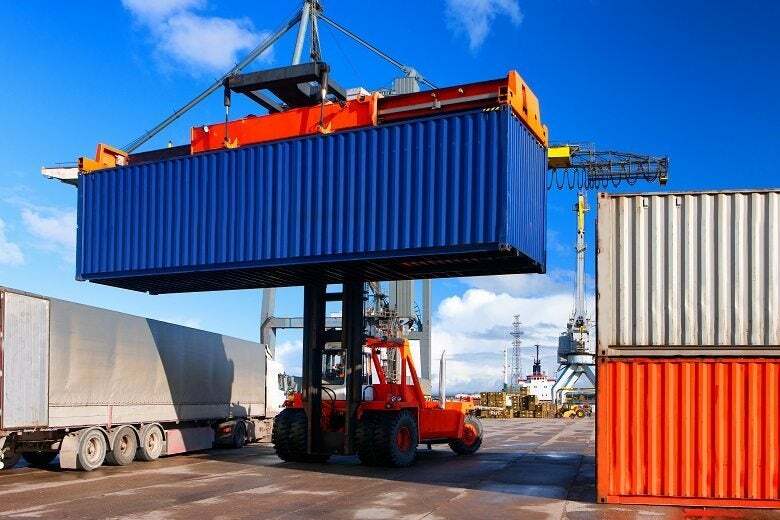 Many sea freight companies will only accept standard 20-foot and 40-foot containers, as this makes stacking them up easier and safer. Another shipping option if you have a relatively small volume of belongings to transport is ‘Less than Container Load’, or LCL, shipping. That’s where you share a standard-sized container with another person’s cargo. This will allow you to ship your belongings by sea if necessary. However, a 10-foot container can be a great option if you are shipping overland. These smaller containers are much easier to manoeuvre and transport than their larger counterparts. That means cheaper shipping costs for you and a smaller carbon footprint. What’s more, they can also fit into most driveways and single parking spaces, allowing you the convenience of taking your sweet time to load up your container. What will fit into a 10-foot container? The internal dimensions of a 10-foot shipping container are 9ft 4” long x 7ft 8” wide x 7ft 10” high. That’s about 72 square feet of floor space to play with. Opting for a ‘high cube’ container will give you around an extra foot of height if you need to accommodate particularly tall items. In real terms though, how much stuff can you actually fit in a 10-foot container? They should happily hold the contents of a small one-bed flat or approximately 2/3 rooms. This makes them an excellent option for singles and students. How do I load a 10-foot container? When it comes to loading your belongings into your container, the key is to have a system. Trust us, you won’t regret it. Start gathering up boxes, newspaper and other packing materials. Sort through your belongings and donate, sell or recycle anything you don’t want to take with you. Start packing and labelling your boxes in a way that makes sense to you, whether that’s by room, by function or by colour (hey, it’s your system). Make a floorplan of your container that allows you to spread out your heavy items, like furniture, and find the things you need quickly and easily when you get to your destination. Find out which items you are prohibited from shipping into your new country. This is often things like hazardous and flammable chemicals, fresh foods, plants and live animals. Rest it on a sturdy, level surface where it won’t get in anyone’s way. Check the floor isn’t damp or dirty. Air it out before you begin loading. Jot down your container number. Use moving blankets to line it. Pack blankets, bubble wrap, newspaper or cardboard around your items to protect them and prevent them from bumping around in transit. Take care not to overfill your boxes – you don’t want a bad back as a lasting reminder of your move! Enlist the help of your friends, family or professional removal companies – it’s a big job to undertake all by yourself. Make sure you stick to your container’s weight limit. Have someone keep an eye on it at all times or lock it up between loads. Load the things you will need first in your new home (like the all-important kettle!) at the end. That way they’ll be first off the container. The cost of transporting a 10-foot shipping container will vary according to your removal company, destination, length of hire, shipping route and even the time of year. As always, it makes sense to compare a few quotes before making your final decision. Quotes should be itemised and, where possible, include estimated amounts for potential extra costs like customs duties, surcharges and overweight container penalties. While transportation costs vary enormously, you’ll find the basic hire rate of a 10-foot container should be pleasantly reasonable. You can expect to pay £10-£40 per week to hire one, making it fairly affordable to give yourself lots of time to load it up – and unload it at the other end. Many companies offer additional services at an extra cost, such as high-security padlocks and packing services. You should always make sure you insure your belongings against theft and damage for the duration of their time in the container.